Since we recently moved into our new home, one thing that needed immediate attention were the blinds. The existing cellular shades were either missing or broken. After a few weeks of debating between shades and would chose between blinds and shutters, or drapes I had a great experience with Jay at Install Solution (based in Foster City). To get in contact with Jay, your first step is to visit Install Solution's website. From there, view example images from his previous job. If you are happy with what you see, find his contact information to setup an appointment. He arrives on-time with samples and very clear explanation of his process. From there, he takes measurements of your windows and sends a price sheet with how much your blinds or shutters will cost. The most important thing to consider when deciding on your shutter is the price. On average, shutters will cost 2-3 times more than regular blinds. Therefore, it is highly recommended shopping around for shutter prices. The way to compare the price is to find out how much each company charges for shutters per square foot. 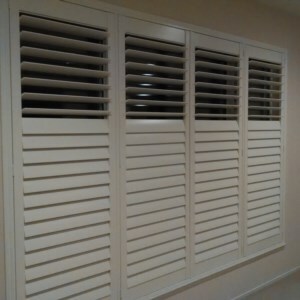 Install Solution offers Norman shutters, that I believe are made in China and shipped custom ordered to Install Solutions. All in all, the time commitment was approximately 30 minutes for the meeting and measurement. Then a second visit for installation that took about 6 hours. The main reason Install Solutions can keep prices low is there is no storefront or inventory. But because Install Solutions doesn't have inventory, the downside is it takes about 6 weeks for delivery of the shutters. After my research online and from friends, I decided the most affordable shutter prices were at Install Solutions. Most importantly, the final result after installation of the shutters was amazing. The installed shutters also have a manufacturer warranty (not from Install Solutions), though I have not had experience with claiming the warranty. Due to the way the original windows were replaced by the previous homeowner, there was not enough space to do an inside mount on most windows except the largest window in the house. In other words, there is not enough room to install the shutters in a way that the shutters are flush with the wall. The only way is an outside mount, which costs more and (in my opinion) doesn't look as good as an inside mount. Therefore, I only ordered one shutter for the largest window in the house. In all, the shutter was split into four panels, with two T-Post to better support the weight of the shutters. Since I never plan to open the windows very often, I also do not plan on opening the shutter door. Therefore, having the T-Post was not a big deal. To give it a cleaner look, we requested the Norman shutters with a hidden tilt bar to control the louvers (moveable blades that control light and privacy). Additionally, the louvers in the upper 25% and the lower 75% have independent louvers. This way, I can let light in through the top while maintaining privacy on the bottom.